EarthLCD.com is a 20 year OEM Supplier of touchscreen LCD products. Our contribution to the Maker market is the arLCD, which is an Arduino at heart product sold by Arduino that includes an Arduino and a smart touchscreen LCD in one product for $99.00. We also recently introduced the open-source Pi-RAQ, which is a Raspberry Pi 2 based internet rack appliance, using our unique 10” by 1” TFT LCD. Come by the OC Mini Maker Faire May 9th and create your own EarthLCD Arduino project. Tickets on sale here. This year at work there was a contest to make the best ornament for the Christmas tree. We, the IT Department, almost never participate in these activities. Well, this year we did. At work I was shown a star cut from a computer motherboard by Robert. Amanda asked, “Hey, can you put lights on this?” I said “Yes, I can use an Arduino”. 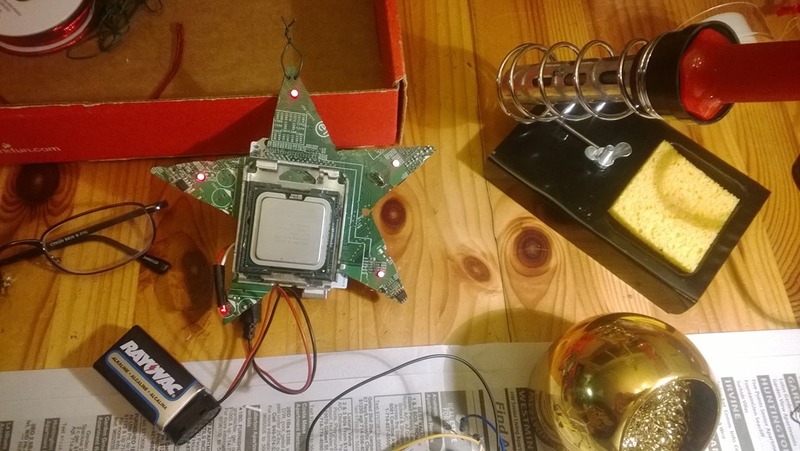 I took the star home to made a prototype. 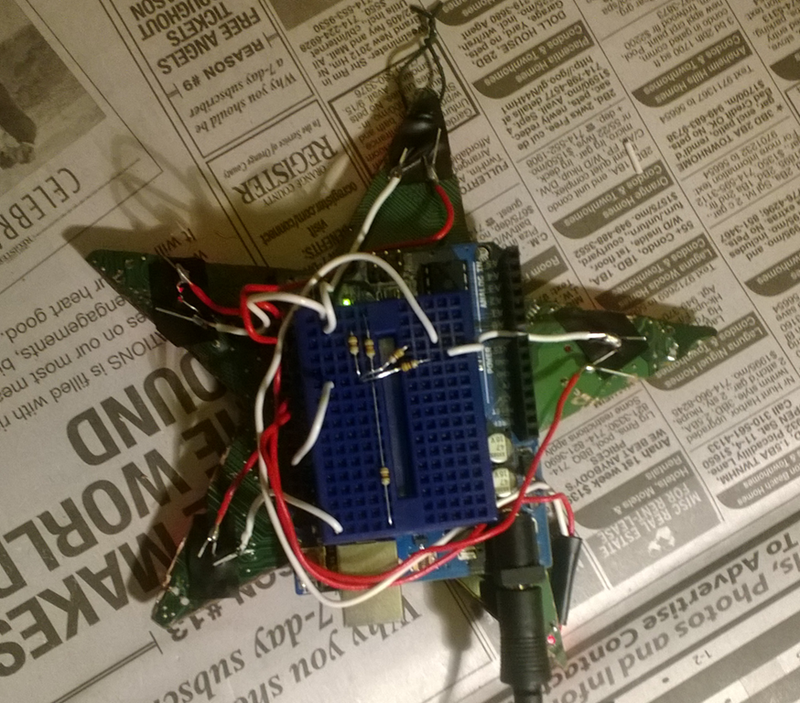 The prototype took a couple hours to cobble together and program. 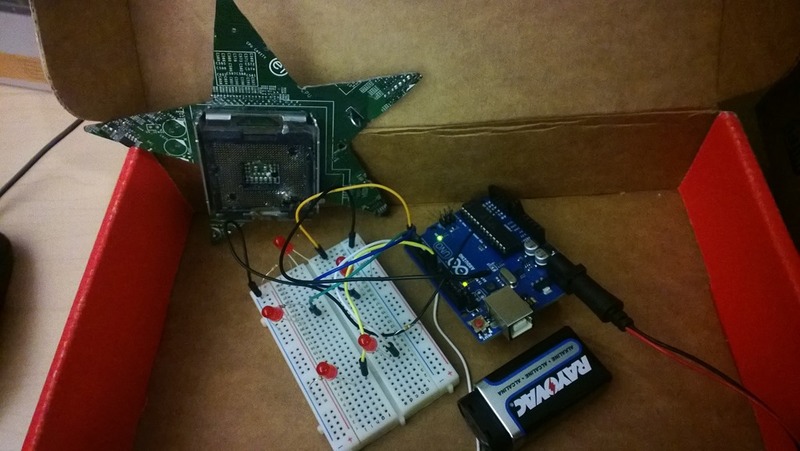 The program makes the lights dim, get brighter and blink using an Arduino UNO some LEDs and resisters. I brought this back to work and everyone liked it. A few more holes were drilled and given back to me with a CPU glued into the socket. The finished ornament! 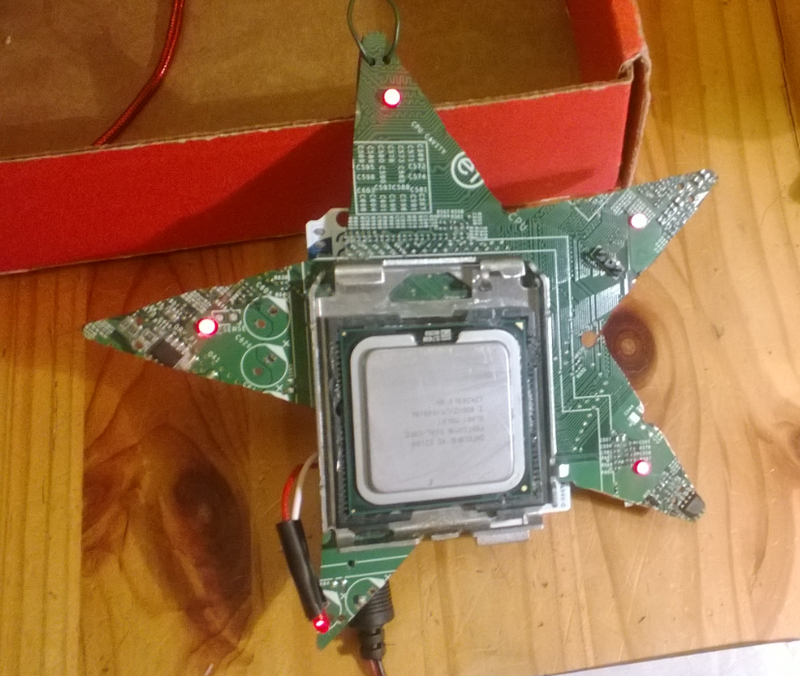 There was no hole for the LED on the leg with the power plug, so I brought the LED around to the front of the star. My workstation on the kitchen table with a $5 soldering iron. The ornament did not win the contest at work. You may have been hearing about this thing called Arduino lately and wondering what it is, well, here’s an introduction from MAKE that’s a good place to start getting an idea. Now, if that’s got you excited and you want to learn more here’s an opportunity to get in there and do some hands-on learning! Trish Tsoiasue, through her Lemonade Game Project, has arranged for Sparkfun to come to Long Beach on October 15th & 16th and offer Arduino classes at the Long Beach Sea Scout base, 5875 Appian Way, Long Beach, CA 90803. Sessions on the use of the LilyPad Arduino. It provides the capability to add lights and more to your sewing projects. This is an introduction to artists, sewing inclined, home costumers. It involves learning about sewable electronics components and the LilyPad. Middle and High School science educators interested in learning how to use sensors, do basic programming with a microcontroller, and find many resources to take classrooms in different directions. Programmers who want an introduction to the Arduino. Artists who have some technical ability and want to make their art move. College students in Engineering and the Arts. 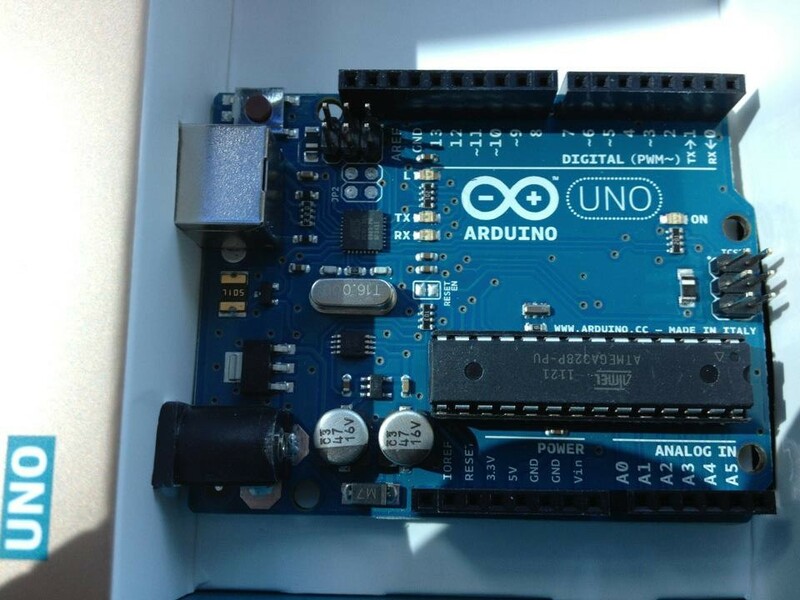 This is an introduction to the Arduino for the technically inclined. Some small exposure to programming is preferred, but not required. In the event of low registrations, Session #2 will be folded into Session #1. Session #1 – No soldering will be performed. Session #2 – Soldering will be performed in this session. Take Home equipment value $125. A SparkFun Inventor’s Kit, Additional Arduino compatible dev board. Space is limited. For more information or to sign up for a session visit Trish’s blog Handmade Penguin. 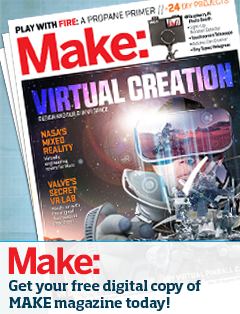 Trish Tsoiasue is working to grow the Maker Ohana in Long Beach as creative Handmade Penguin. She has a degree in Computer Science and has worked in a technical field for over 30 years. She is committed to community, and is a co-founder of 501c3 non-profit Shared Science which works to bring engineering and technology programming to youth with current focus in the Long Beach area. Trish attended the San Mateo MakerFaire in 2012 as an Education Day volunteer, a MakerCorps volunteer and as media. She has continued in her quest to bring Making to Long Beach as a Blogger for the Belmont Shore Patch. Since June 25, she has been blogging daily about Makers and Creatives in Long Beach in a game she has created called The Community Lemonade Game. Trish also volunteers heavily with the BSA Long Beach Area Council. Trish invites everyone to make Lemonade with her. If you’d like to catch up on Trish’s scavenger hunt through Long Beach, follow her game from day 1. It’s a lot of following, so if you’d just like to pick and choose, follow her blog directly. Now that we’ve (mostly) recovered from the success of our first ever OC Mini Maker Faire we’re beginning to look to the coming year. On the top of the list is arranging a date that will not coincide with other major events that attract like-minded people. With that in mind we’re considering the first couple of weeks in August 2013, anybody out there know of potentially conflicting events for that time frame? What we need are volunteers or groups to help supply and run these activities so, if you or anyone you know might be interested please contact us at Info@OCMiniMakerFaire.com. Also, if you have an idea for a great booth, we’d love to hear about it!